October 8, 2014, 2:06 PM · If there is a "Bach Double" for violin and viola -- something fun, popular and compelling in duet form -- it's got to be the Handel-Halvorsen "Passacaglia." The Handel-Halvorsen balances the violin and viola (or sometimes cello) beautifully, puts both instruments through equally challenging paces, and (unlike the Bach Double) it doesn't even require a piano or orchestra accompaniment to sound thoroughly complete. But did you know that you can play it with two violins? The great violinist Jascha Heifetz actually re-wrote this piece for two violins, and his version was discovered only recently. In fact, Heifetz' second-violin manuscript for the Handel-Halvorsen sat, untouched, among his effects until the summer of 2012, when University of Michigan violin professor Stephen Shipps and Curtis and Juilliard professor Eric Wen unearthed it while digging through hundreds of Heifetz Collection boxes at the Library of Congress. Heifetz' version of the Handel-Halvorsen Passacaglia, arranged for two violins, is now published and available through Shar. Last summer I spoke with Stephen Shipps about the Handel-Halvorsen, the newly discovered and recently released edition, and about what kinds of things they found while looking through the Heifetz Collection. Laurie: Do you remember your first impressions of the Handel-Halvorsen Passacaglia, either from hearing a recording, or seeing it played, or playing it yourself? Stephen: My first impression of hearing that piece performed was when my teacher in high school played the recording of Heifetz and Primrose, from the 1930s. Also, Gingold's students would get together a couple of times a year and listen to old recordings -- that was before everything was available online. We listened to it while listening to old '78s, and I just remember being floored with the level of playing both by Heifetz and by Primrose. It was also a big deal for us at Indiana because Primrose was on the faculty. He was my chamber music coach freshman year, and then later I had lessons on the piece with Primrose, which was really pretty exciting. Laurie: Does that mean that you got to play it with Primrose playing the viola part, in the lesson? Stephen: No, I played it with one of his students. Then, for the last 40 years, I've been performing it! Sometimes violin-cello, but almost exclusively violin-viola. Laurie: What level of a piece is it? Laurie: Tell me about how you unearthed these Heifetz editions. Stephen: I had this wonderful experience of working with Endre Granat, editing a series of Ševcík books for Lauren Keiser Music Publishing. We did seven of those books, which are available through Shar, and we have one more of those coming to complete that series. In the mean time, our publisher made an arrangement with Heifetz' son, Jay Heifetz, and bought the rights to everything that was unpublished by Heifetz -- print music or manuscripts. After buying the rights, Keiser asked his editors to go through (the unpublished works) and determine what should be published and not published, what would be useful. Eric Wen, Endre Granat and I are the three violin editors for Lauren Keiser, so Eric Wen and I met in Washington and went through hundreds of boxes of Heifetz material. Stephen: There are approximately 210 boxes of Heifetz material at the Library of Congress -- everything from programs to invitations to correspondence to autographs from Shostakovich, letters from Benjamin Britten -- everything! The whole correspondence about the Walton Concerto is there. We went through it box-by-box and tried to figure out what was there and what was publishable. And first, we found the Handel-Halvorsen, in the version for two violins. The second violin part was a very clearly-written manuscript by Heifetz. It is based on Halvorsen, but it has his own touches. Laurie: Did you or Endre or Eric know about the existence of this? Laurie: Did Heifetz ever play it? Stephen: I think it was probably played at dinner parties, but it was never played publicly, that we knew about. But it was a very clear manuscript, dated in 1920, and revised in 1966. Laurie: Is this version of the Passacaglia with two violins the sort of thing that can be played by violinists of two different levels? Is the second violin part easier? Stephen: The second violin part is just as difficult as the first violin part, so you need two players who are pretty well on the same level. It's not a first violin and accompaniment at all. Laurie: Since you've been playing the second violin part, how is it different? Are there different harmonies, actually? Stephen: Yes, it starts out differently. 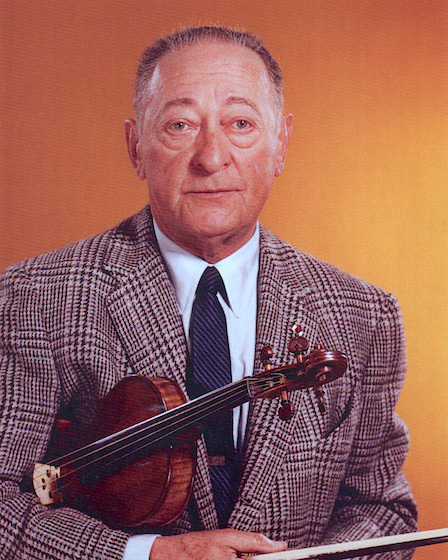 Heifetz was a very well-trained composer, and very adept at what he composed. He wrote beautifully for the piano as well as for the violin. We forget that there was a whole line of violin-composers, starting with Corelli and going forward to this day. Kreisler, Ysaÿe, Wilhelmj, Joachim, and then Heifetz, not to mention Milstein, did dozens and dozens, and in a case like Kreisler and Heifetz, hundreds of arrangements that they used in their concerts. Of course, it's not so prevalent today; there are very few violinists who do their own cadenzas, their own transcriptions. Joshua Bell is doing his own cadenzas for Beethoven, Brahms and Mendelssohn, which is fantastic. On a side note, they're not as needed today because people don't play short pieces in concerts any more, they just play sonatas, which has put everybody to sleep, so that's too bad. I'm so thrilled with Hilary Hahn, having commissioned 27 short pieces on her last CD. She's starting to fight back on that, which I think is great. And James Ehnes has made this wonderful statement about the violin recital, and trying to resuscitate it. So maybe this will come alive again. Laurie: I don't think I've ever heard the original Handel Passacaglia, the piece this duet is based on. Stephen: It's based on eight bars of a harpsichord suite by Handel (Handel's Suite No. 7 in G minor) and the rest of the piece was put together by Johan Halvorsen, a Norwegian composer. So the Passacaglia that we know of is a Halvorsen piece and not a Handel piece. Laurie: If Heifetz changed the harmony, was it based on the original eight bars, or...? Stephen: I don't think he knew the original eight bars; he was (practicing) the old school of changing harmony. As recently as the 1920s and 30s, people would put out editions of the Bach Sonatas and Partitas and if they didn't like a note, they would change a note! It was a different time. He didn't worry about what was in the manuscript or what was original. He wrote what he thought would work, and he does that often, through the entire repertoire, as well. He re-writes things in the Bach Chaconne, in the last page he does things that are different than in the manuscript. He does it because it's more effective. That's fine. My last teacher was Franco Gulli, and Gulli had a philosophy about Heifetz: that he was the world's greatest violinist for second-class composers because he would make changes to their pieces. Heifetz was a superior talent to all of them. Laurie: I'm curious about what else was in all those boxes! Stephen: Well, one thing we found out about Heifetz is, he never threw anything away! It was complete, what was in these boxes. (The Handel-Halvorsen-Heifetz) became my project. We also found seven or eight short pieces -- Strauss, Rachmaninov, some Fauré -- that had never been published by Carl Fischer. Eric Wen is putting that book together, and it will come out next year. The highlight of that book will be the slow movement of the Rachmaninov Cello Sonata, arranged for violin. Laurie: This was the manuscript in Wieniawski's hand? Stephen: Yes, the original manuscript. It was shockingly beautiful, the handwriting was just wonderful. Each one of us went through about 100 boxes, then when we found something, we'd look at it together and say, is this publishable or not? There were a lot of things that are just curiosities: letters, contracts, details of Heifetz' relationship with his management, pictures, medals, all sorts of things. It's very complete. Except for one thing; the one thing that's missing are his parts of all of his most famous concertos. He was, of course, known for the Tchaikovsky Concerto, the Brahms, the Mendelssohn -- these are pieces that he made his career on for a half-century, and those were conspicuously missing. I asked Endre Granat about that. Granat knew Heifetz very well; he studied with him and they were close friends. Granat said that he probably destroyed those because he was very careful not to let out those secrets, how he played all those pieces, to anyone. Laurie: Not even to his students? Stephen: Sometimes the only people who knew were the students. Endre studied with Heifetz, and I think that's going to come next in this project. In Endre's library, he has Heifetz' markings, in Heifetz's handwriting, for some of those great pieces. I think we're going to ask for permission from Jay Heifetz to put those out as well. Laurie: So to be clear, Endre doesn't have any originals, but he just has what he did with his teacher? Stephen: Yes, what Heifetz wrote in (Endre's) music, when he studied these pieces in the Heifetz masterclasses. But that has to be approved by Jay, everything has to be approved by Jay Heifetz. October 8, 2014 at 10:06 PM · The HH isn't the only "Bach Double" that can be done on violin and viola: The oboe part of the Violin-Oboe Bach Double can also be played on the viola. October 8, 2014 at 10:42 PM · As it can also on the violin. In my chamber orchestra we did a performance of the Bach violin-oboe in Gmin arranged as a double violin concerto. Worked very well (as you'd expect with good old J.S.). October 8, 2014 at 11:18 PM · Do you mean this one? Very cool! The arranged Rach cello sonata sounds most interesting! October 9, 2014 at 10:38 AM · Yes Laurie, I mean that one. My late father and I played it through many times with at least two of his pianists, using either violin or viola for the oboe part (we never bothered to transcribe it for viola), and I think I sometimes played the oboe part. I'm also sure that the edition we used was in D minor, rather than C minor. At one point, on the second hexuplet passage in the last movement, he commented "This is harpsichord music!" (He also commented "This is clearly clarinet music" about the Brahms Clarinet/Viola Sonatas. About some passages, I see what he meant: An arpeggio run on a beat naturally accents that beat on the clarinet, but on the viola, it's an enormous effort to make that beat sound like the accented beat and not make it lean onto the next beat). October 9, 2014 at 02:54 PM · I'm pleased to see that at least some of Jascha Heifetz's performing secrets of the big concertos (Brahms, Mendelssohn, et al) are still essentially secret, and long may they remain so! This will encourage the younger generation to work out their own solutions to problems and to implement their own ideas of interpretation and performance. This is what J.H. himself must have done.